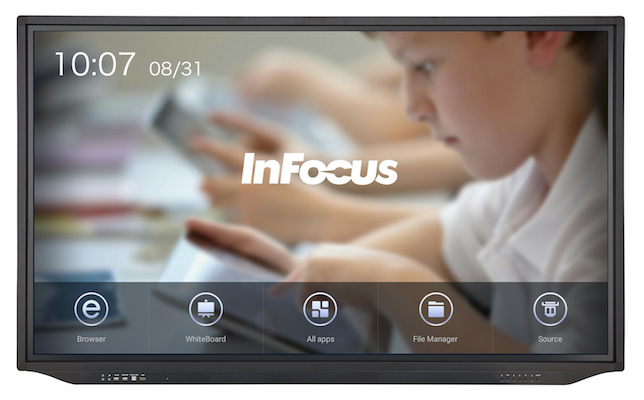 InFocus recently revealed plans to launch an interactive Chrome whiteboard display designed specifically for use in classrooms, and now the display manufacturer is rolling out the first Android-based, interactive touch display solution capable of 4K resolution. The JTouch Plus INF7530eAG. Image: InFocus. Also intended for educational purposes, the new JTouch Plus INF7530eAG is designed as an all-in-one teaching and collaboration solution. It has a 75-inch JTouch display and runs an Android operating system to support whiteboarding, document viewing, web browsing and wireless casting with Android applications. “Educators can easily download and utilize education applications by logging in to the Google Play Store,” according to information from InFocus. In addition, the display does not require a remote since with its Total Touch Control system management interface. Teachers and students can simply touch icons on the display to navigate — annotating over any application or video input and saving the screen to an external USB drive. The model is priced at $4,399 USD MSRP with a $1,000 discount for K–12 schools when purchased directly from the manufacturer; it is also available through InFocus resellers.